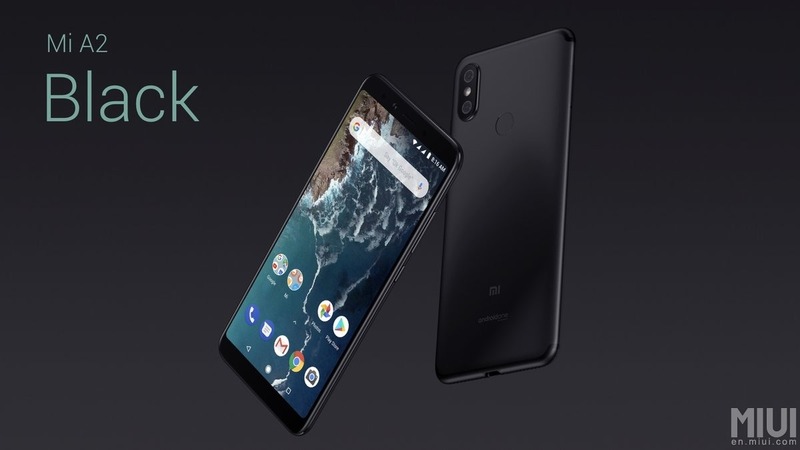 Xiaomi launched its first Android One smartphone last year, and it was the first time we saw a phone from Xiaomi with no MIUI skin on top. The phone had superb build, impressive specs, and great price. Due to this, the phone was a huge hit and undoubtedly one of the best budget phones of last year. Today, the company launched two new Android One phones at the global launch event in Madrid, Spain. 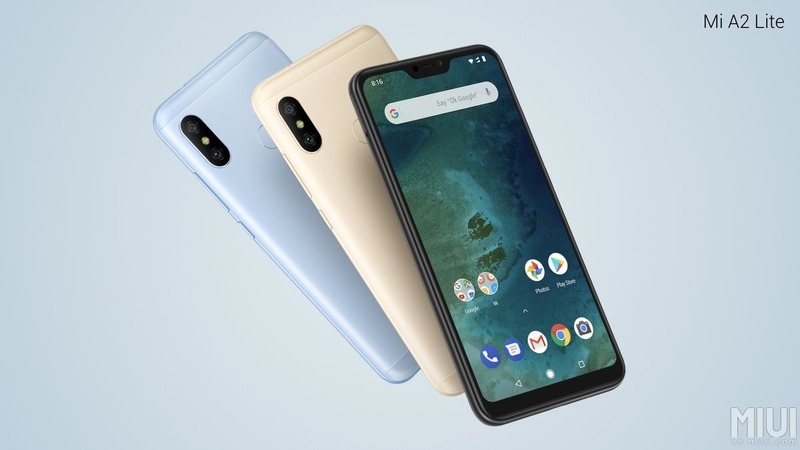 One of these two phones is the Xiaomi Mi A2, the successor to the last year’s Mi A1, while the other is a cheaper Mi A2 Lite. We already know almost everything about both the phones but since these two are now official, let’s talk about each of the devices in detail. Do you remember the Xiaomi Redmi 6 Pro that launched in China this month? 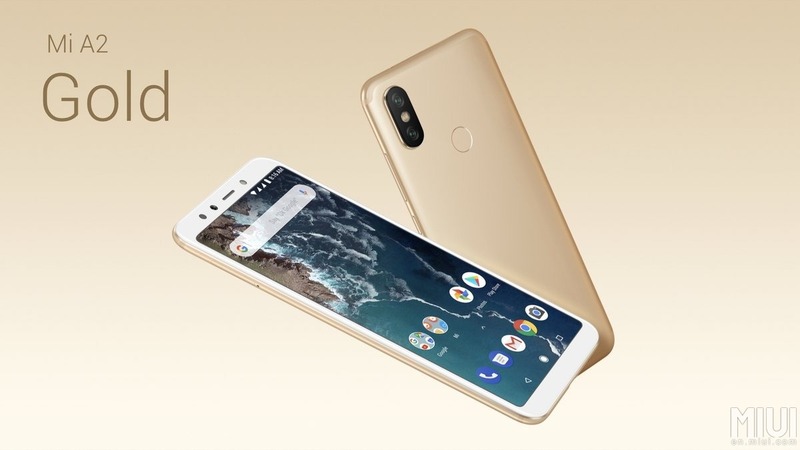 Well, the Xiaomi Mi A2 Lite is nothing but the Redmi 6 Pro with Stock Android. All the specifications remain the same, and the only difference is the Android One branding. So, there is no MIUI skin on top. If you have seen the Redmi 6 Pro, then the design of the Mi A2 Lite may not be that impressive for you. There is a notch on top, and the phone has a huge bottom chin. On the rear, the phone has a vertical dual camera setup. So yes, there is nothing fancy about the overall design. It’s just a typical Xiaomi smartphone with iPhone X-like design language. 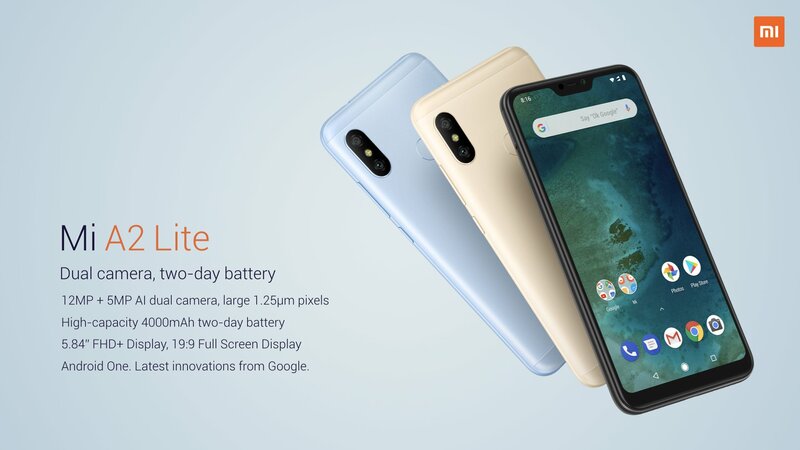 Talking about the specifications, the Xiaomi Mi A2 Lite seems a pretty good budget Android One smartphone. It has a 5.84-inch Full-HD+ display with an aspect ratio of 19:9, thanks to that notch. The display has rounded corners, and the company didn’t mention any Gorilla Glass protection. Under the hood, the phone has the Qualcomm Snapdragon 625 processor. So yes, this is yet another phone from Xiaomi that is launching with Snapdragon 625. The first time we saw this processor on any Xiaomi phone was last year when Redmi Note 4 launched. There is nothing wrong in using this processor, however. It is still one of the most power efficient and well-balanced processor. 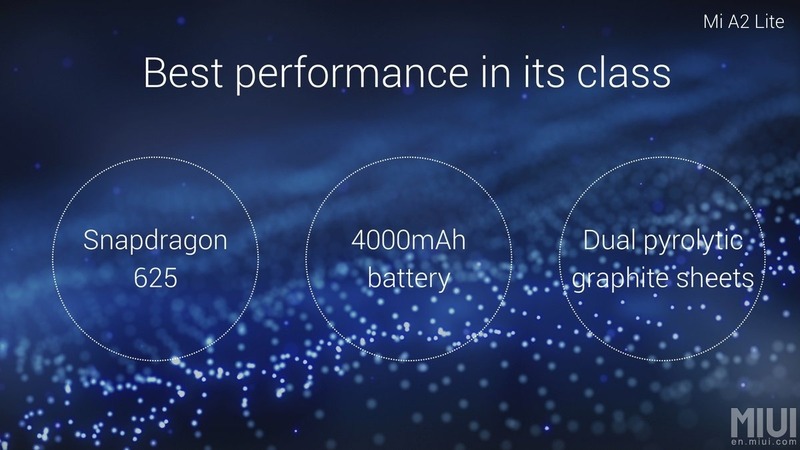 Considering that the Mi A2 Lite has a massive 4,000mAh battery, its combination with the Snapdragon 625 means the phone will easily last a full day on heavy use. 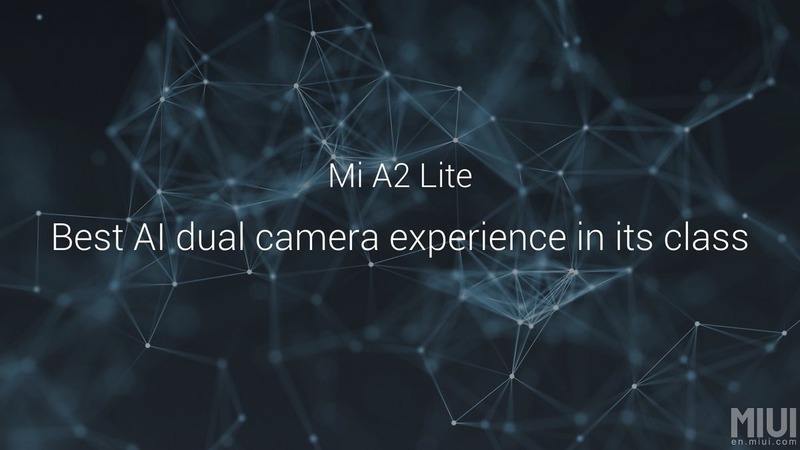 The Mi A2 Lite is a dual camera smartphone from Xiaomi, and it features the same dual rear camera setup as we saw on the Redmi S2. 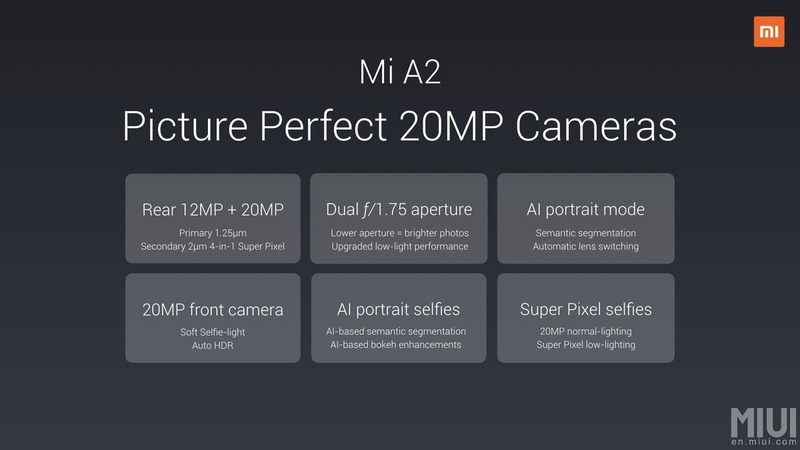 So, there is a primary 12MP camera with 1.25-micron pixels, f/2.2 aperture, and PDAF. The secondary rear camera is a 5MP depth sensor with f/2.2 aperture. On the front, the Mi A2 Lite has a 5MP camera for selfies. This is an Android One device, so it runs on stock Android 8.1 Oreo out of the box. 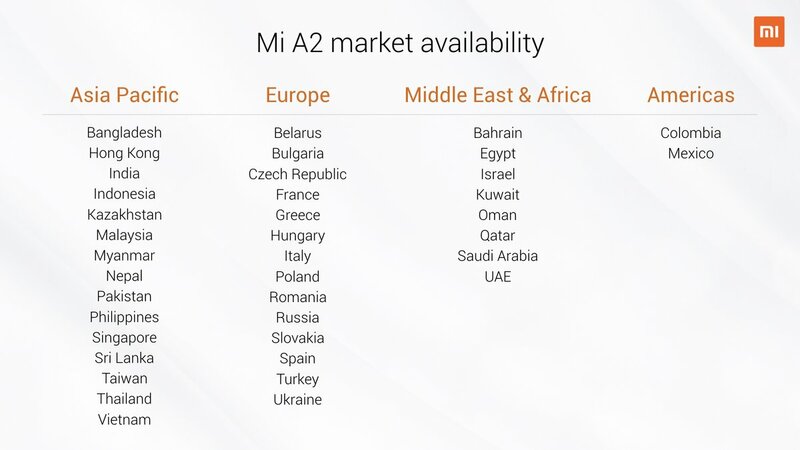 There are a few Mi Apps, but except that, it is all pure stock Android. 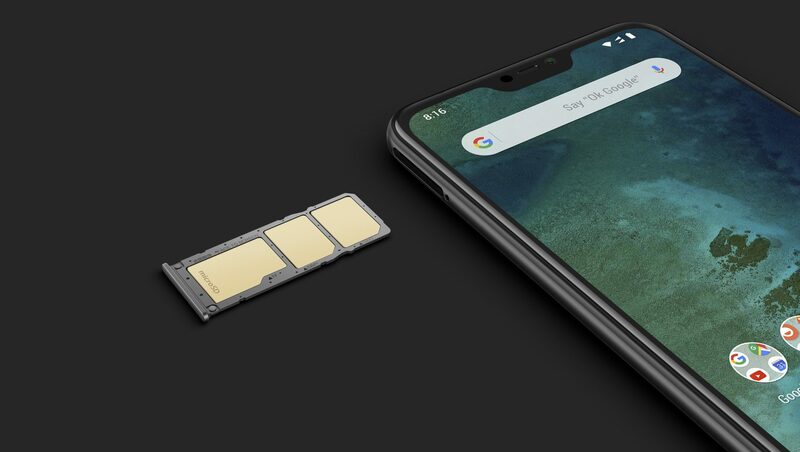 There is 3/4GB RAM and 32/64GB internal storage with a triple card slot that lets the user have dual SIM cards as well as a microSD card at the same time. The memory can be expanded up to 256GB. The phone is going on sale in France on July 27, in Italy on August 8 and in Spain on August 10. 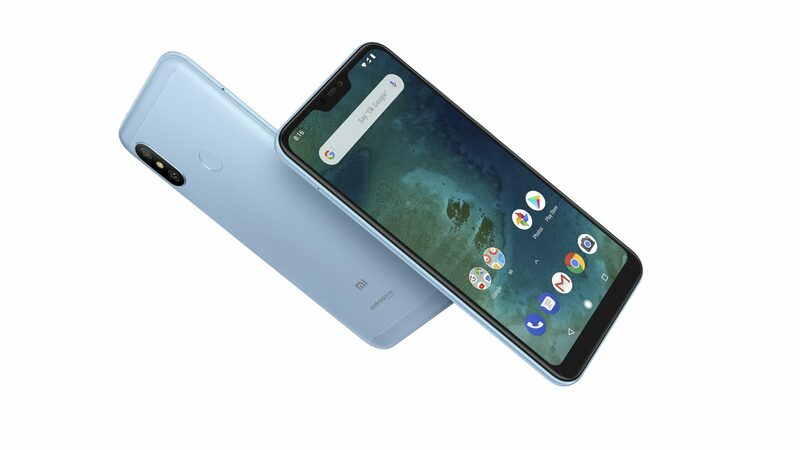 The Xiaomi Mi A2 is a mid-range Android One smartphone that is a successor to the last year’s much popular Xiaomi Mi A1. The Mi A2 is an upgrade in almost all the aspects, whether it is the camera or the battery or the display or the processor. The design doesn’t get much of a change, though. 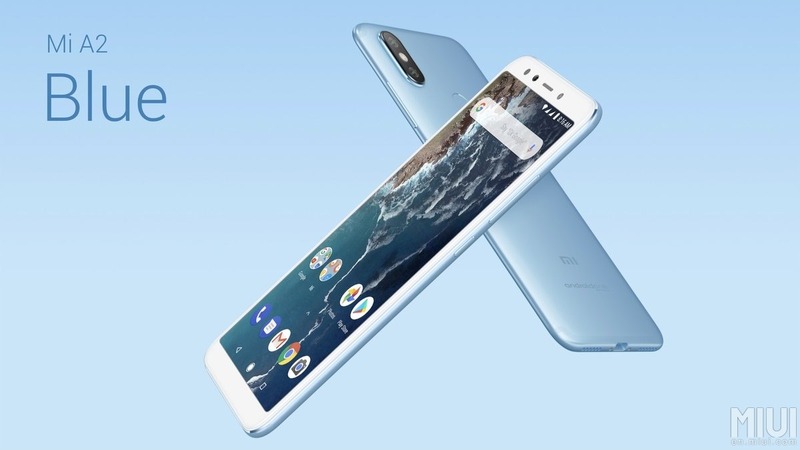 The phone has a unibody Aluminum build, and like many Xiaomi phones launched this year, the Mi A2 has an 18:9 display on the front with rounded corners and a huge bottom chin. It would’ve been nice to see capacitive touch buttons on the bottom chin, just like last year’s Mi A1. This would’ve resulted in more space for the screen. 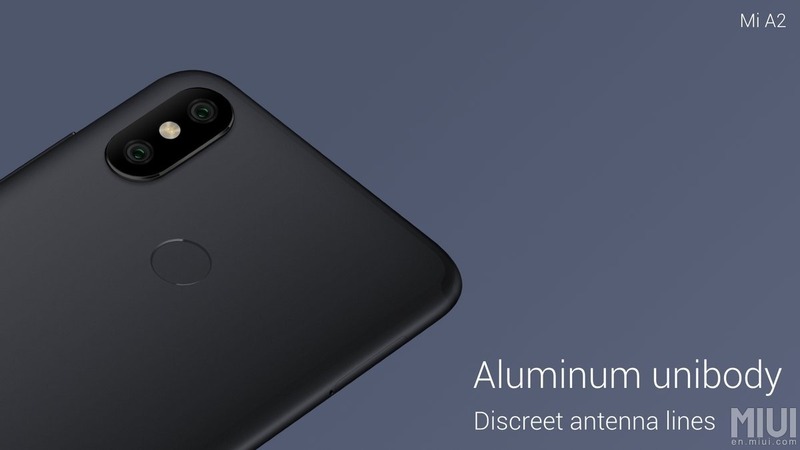 There isn’t anything new regarding the design as it looks like just another Xiaomi phone of 2018. There is a vertical dual camera setup on the rear. The camera bump is huge and bigger than the one on Redmi Note 5. The fingerprint reader is also placed on the rear. 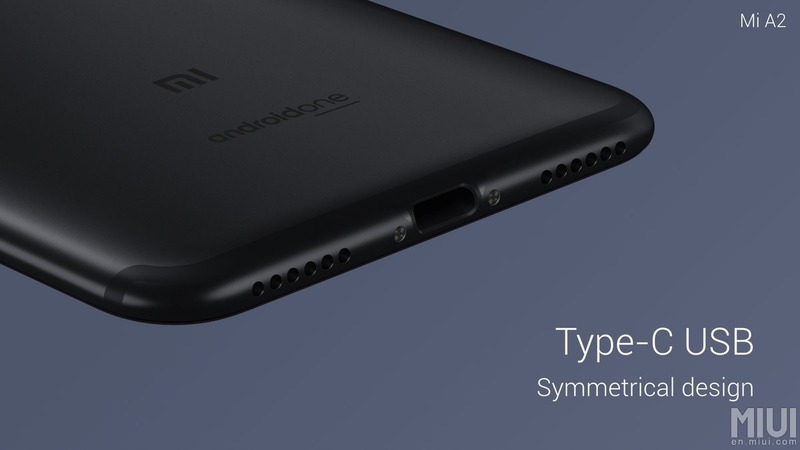 One of the major cons of the Xiaomi Mi A2 is the lack of 3.5mm headphone jack. However, it is nice to see USB Type-C Port on the Mi A2. It is sad to see mid-range phones with just a single slot for all the I/O tasks. Also, there is no SD card slot on the Mi A2, which means if you are a user who likes to keep a lot of data on his/her device, then you should go for the variant with 128GB ROM. Coming to the specifications, it is just the Xiaomi Mi 6X with Android One branding. So, there is a 5.99-inch IPS LCD with 18:9 aspect ratio and an FHD+ resolution. One of the most interesting things about the display is that it is protected by the Corning Gorilla Glass 5. This is something we rarely see on mid-range phones. 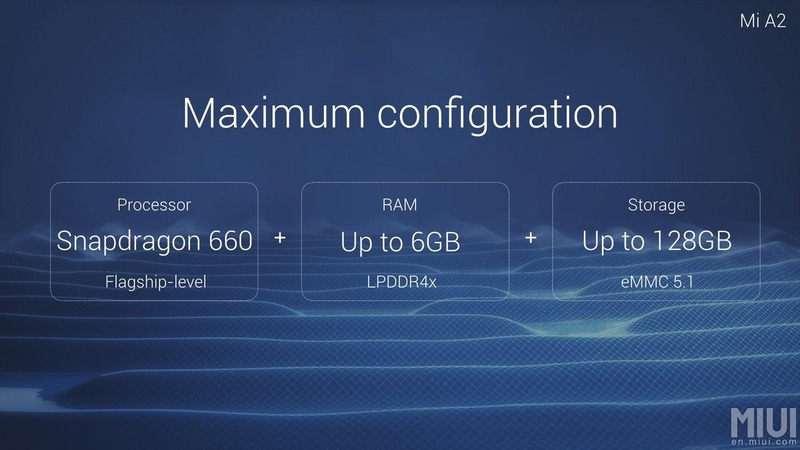 Under the hood, there is the powerful Snapdragon 660 processor, which is undoubtedly a beast when it comes to performance in the mid-range segment. It simply flies through anything you throw at it. 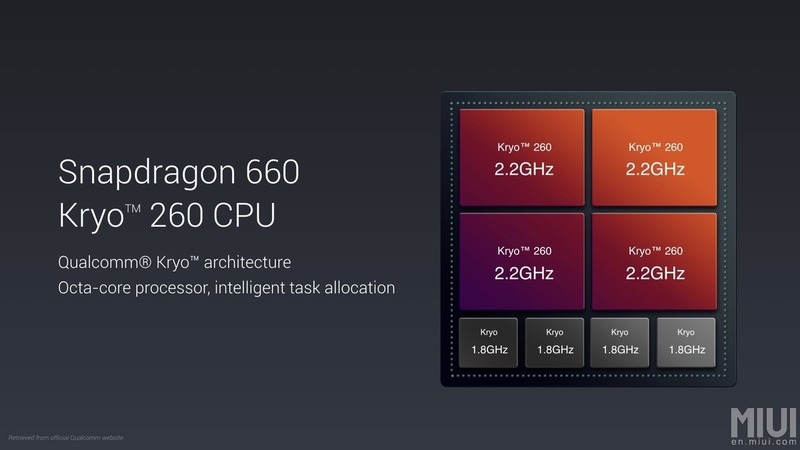 It has the same Kryo 260 cores that are present in the Snapdragon 636, but the 660 is clocked at a higher rate, making it more powerful than the 636. 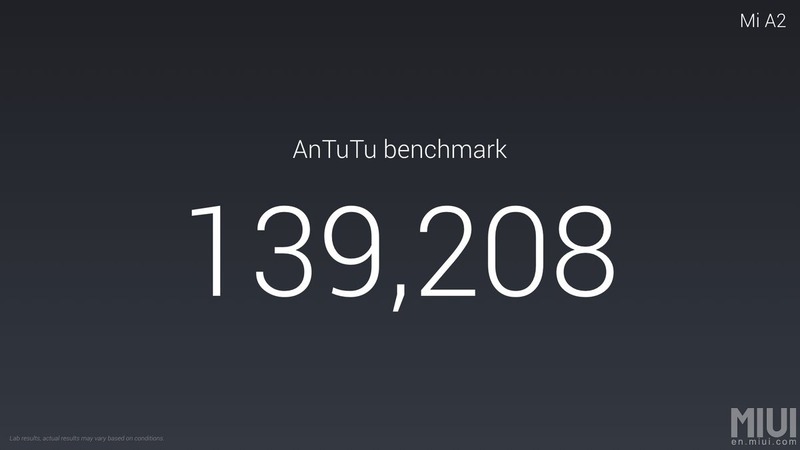 The AnTuTu Score of 140K, therefore, needs no explanation. 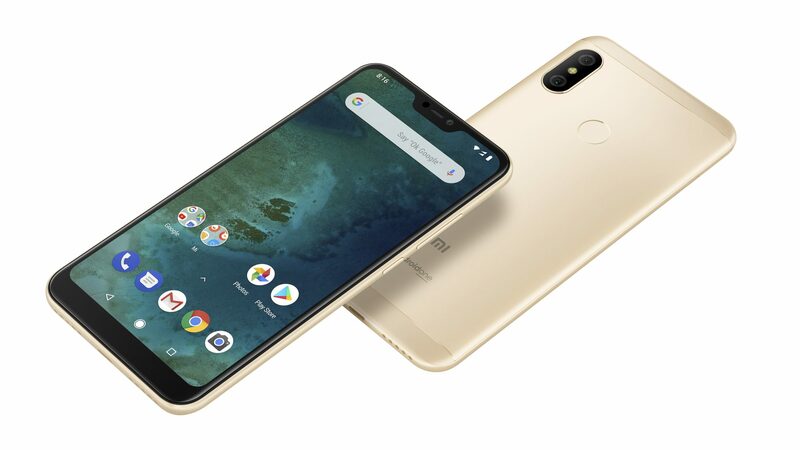 The Xiaomi Mi A2 comes with 4/6GB RAM and 32/64/128GB internal storage. As mentioned above, there is no SD card slot, so no way to expand the memory. 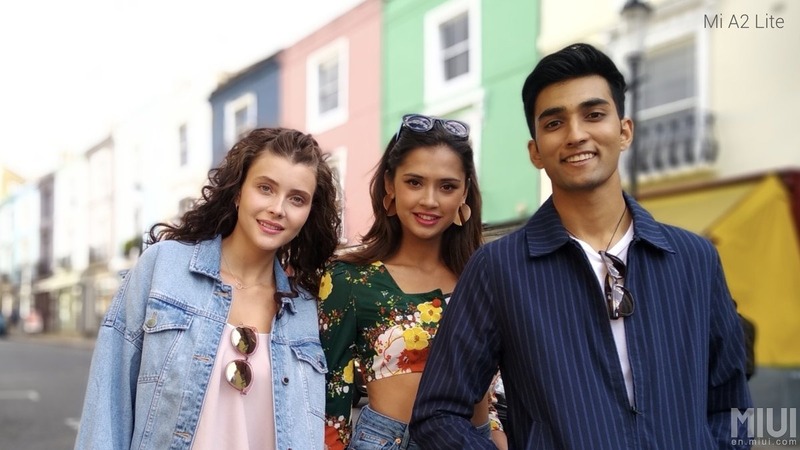 At the launch event, Xiaomi focused a lot of the cameras on the Mi A2. The phone has a dual rear camera setup with a primary 12MP f/1.75 Sony IMX 486 sensor with 1.25-micron pixel size and a secondary 20MP Sony IMX 376 sensor with f/1.75 aperture and pixel binning technology that combines four pixels into one. The dual f/1.75 aperture means that the low-light photography is surely going to be superb. There is also an AI portrait Mode, Semantic Segmentation, and Automatic Lens switching. The Automatic Lens Switching automatically selects one of the two rear cameras as per the lighting condition. 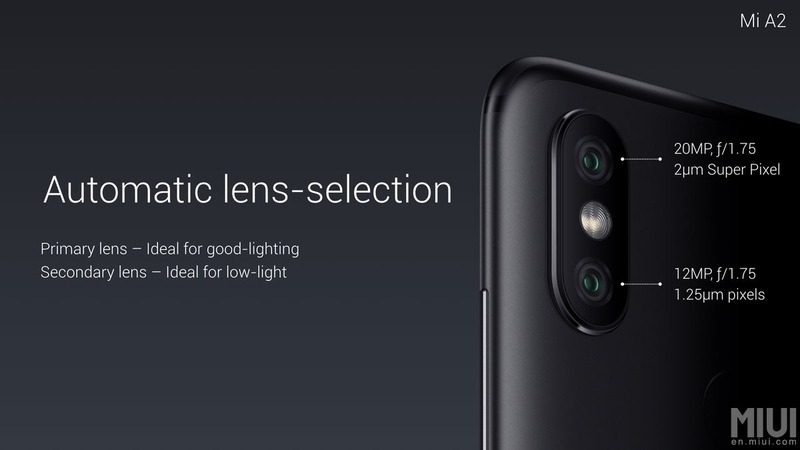 So, if there is good light, the 12MP camera is used, and if there is low light, the 20MP camera is used. One of the major cons of the Mi A1 included a poor front-facing camera, and this is not the case with its successor. 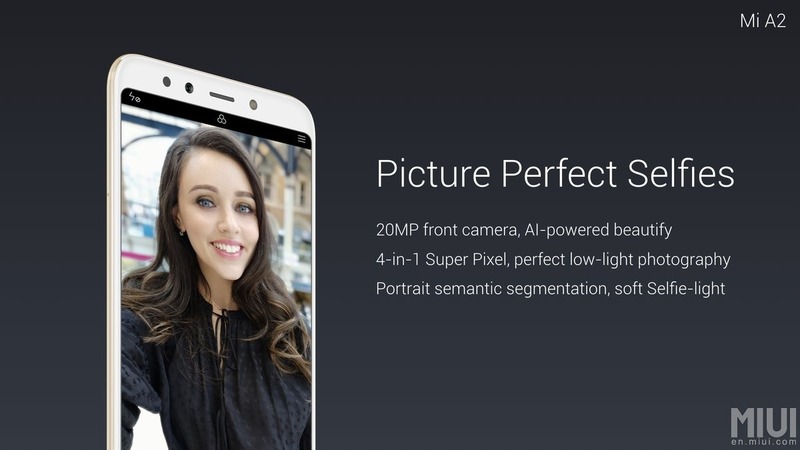 The Mi A2 has a 20MP front-facing Sony IMX 376 sensor that features the same pixel-binning technology and Portrait Semantic Segmentation as the rear camera setup. There is also a front-facing flash and AI Beautify feature. 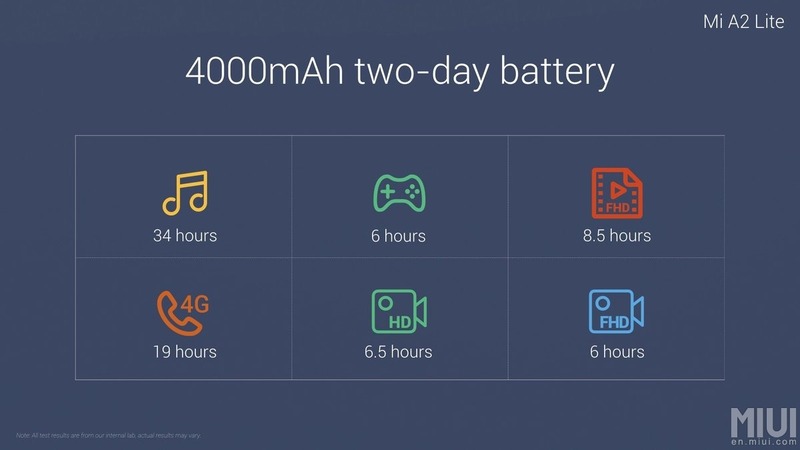 Just like the Xiaomi Mi A1, the Mi A2 has a small 3,000mAh battery under the hood (3,010 to be precise) which is surely not enough to last a full day on heavy use. However, the phone supports Qualcomm Quick Charge 3.0, which is a nice and handy feature. We don’t know if the adapter inside the box will come with Quick Charge 3.0 support or not. So, you may have to get a new adapter for fast charging. 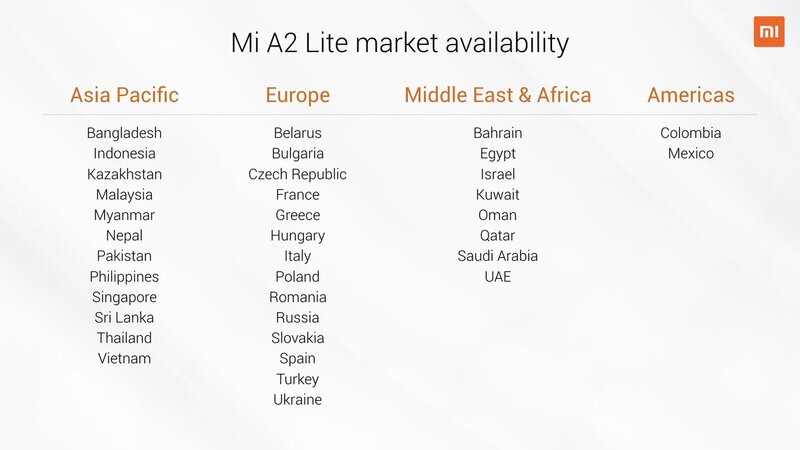 The European pricing is always higher than the pricing for other markets so expect the phone to launch in other markets at a lesser price. The phone will go on sale in Spain on August 10, in France on July 27 and in Italy on August 8.